2007 is a great vintage for Gewurztraminer, with great acidity and also perfect climatic condition for superb botrytis, so it is logic to be able to produce some SGN with this grape variety. What was surprising to us, is that it was possible to obtain these rare wines in two vineyards which never allowed us to produce such wines: Goldert and Hengst! It is not unusual to obtain late harvest ripeness level in the Goldert, because this vineyard does favour a late ripening of the grapes and is capable to build enough structure in the grapes to allow high maturity.. However, in order to reach SGN level, the concentration has to be pushed to the maximum and there must be enough botrytised grapes to select to obtain a small volume of wine. 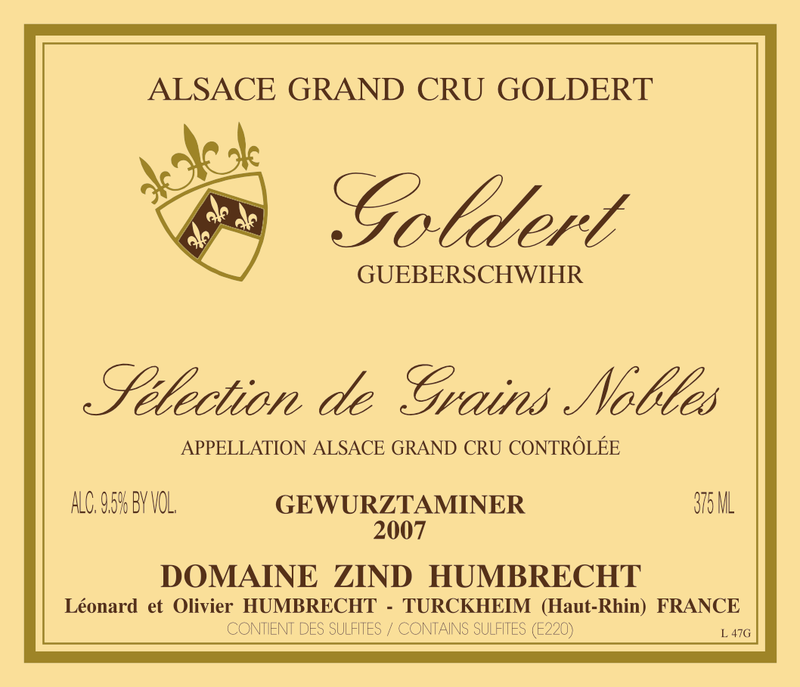 Goldert is a small vineyard, and never in the past had we enough homogenous noble rot as in 2007. As the weather forecast was excellent, we took our time and went for SGN. I can only say one thing: no regret! The fermentation was actually quite fast, but these rich wines do sometimes require a longer ageing to allow for proper clarification. 2/2009: almost closed for the first year of its life, this wine has now open up to some beautiful aromas of ancient roses, minerals, wet stones, spices, ‘pot pourri’ (dry flowers) and of course all the classic flavours of honey/wax associated to SGNs. There is no doubt that it is difficult to describe in detail all the scents the nose can pick up! The palate is unctuous, rich but so elegant and inviting. This style of SGN won’t need many years to satisfy the palate. It is dangerously drinkable today, but of course will be so much more complex in the years to come. The finish is round and reveals perhaps more the true nature of the calcareous vineyard with more smoky/spicy flavours.